This chart shows why everyone's favorite e-commerce trade has more upside ahead of it in 2018. E-commerce behemoth Amazon.com Inc. (AMZN - Get Report) is on fire in 2018. After surging more than 55% during 2017, Action Alerts Plus holding Amazon is following up with a repeat performance, up another 31% and change since the calendar flipped to 2018. If you're starting to think that Amazon's rally is getting fatigued here, think again. Instead, Amazon just sent investors a huge buy signal this week. To figure out how to trade the next leg higher in Amazon, we're turning to the chart for a technical look at what's fueling this rally -- and when you should buy it. Amazon was teetering on the verge of breakout territory just a few weeks ago. Now, that breakout has happened, and Amazon's high-probability move is higher ground. Amazon's price setup here is a textbook example of an ascending triangle pattern, a bullish continuation pattern that signals more upside ahead. The pattern is formed by horizontal resistance up above shares (at the $1,475 resistance level), with uptrending support to the downside. Amazon's breakout through $1,475 was the signal that buyers remain in control of shares. Since then, a throwback is giving investors a second chance to take advantage of Amazon's rally. A throwback happens when a stock breaks out, and then moves back down to test newfound support at that former price ceiling level -- in this case, our $1,475 price level. And while throwbacks look ominous, they're actually constructive for stock prices because they re-verify the stock's ability to catch a bid at support. For that reason, it's best to think of a throwback as a buying opportunity in shares of Amazon, not a red flag. More importantly, that throwback just happened this week. Relative strength, the side indicator down at the bottom of Amazon's price chart, adds some extra confidence for more upside here. Our relative strength gauge has been in an uptrend of its own since last fall, signaling that this stock is still systematically outperforming the rest of the broad market, even after its huge run higher this year. 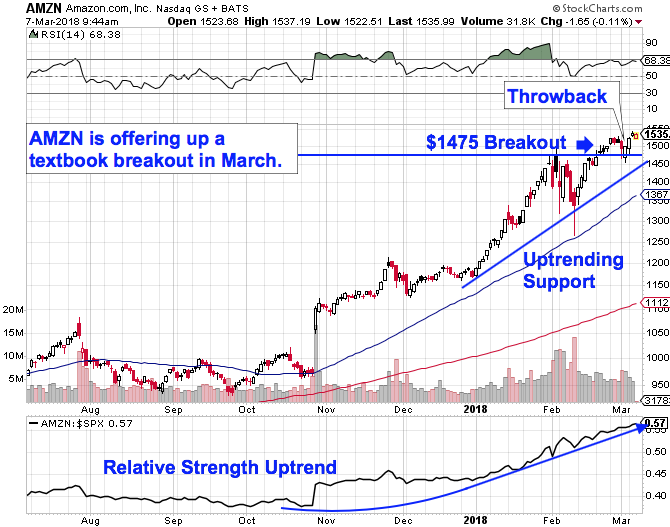 As long as that relative strength uptrend remains intact, Amazon is statistically predisposed to outperform. Risk management is still important, especially in this market. The 50-day moving average has been acting like a decent proxy for Amazon's uptrend since the start of the year; that makes it a logical place to park a protective stop. With a breakout move in the rearview mirror, now looks like as good a time as any to be a buyer in Amazon.com.